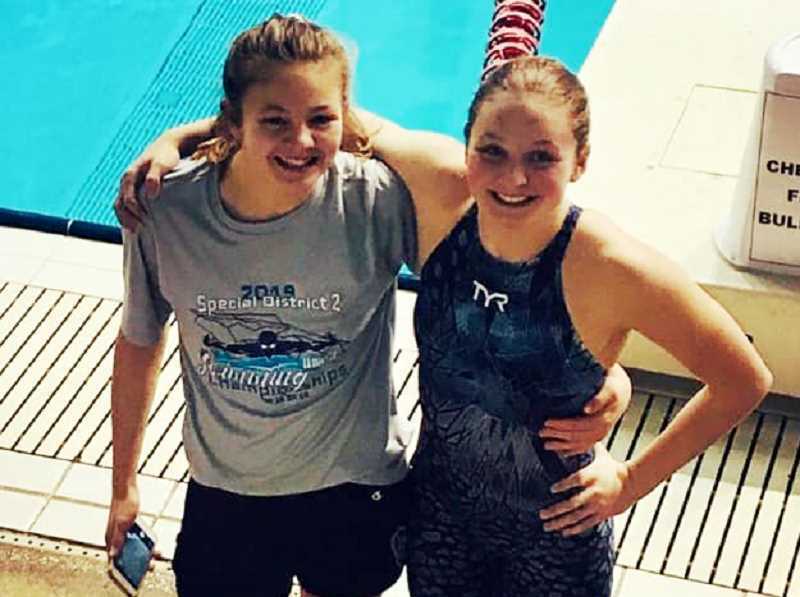 Two sisters, both swimmers, Elli and Lexi Williams, traveled to Federal Way, Washington, for the 2019 Northwest Region Age Group Championships swim meet March 21-24. Swimmers from all across the Northwest qualified to participate in the elite competition. Swimmers who qualified in their state competition faced swimmers from Hawaii, Alaska, Idaho, Washington, Montana, Wyoming, and Oregon. "We go from state level, to region, but you have to make qualifying times to make all these meets at this level," Madras Swim Team coach Sarah Nelson said. "You don't just go. You have to be this fast to go." Lexi, who turned 13 five days before the regional competition, competed as a 13-year-old. Elli, a third-place state finisher in high school as a Madras High freshman, competed at the 14-year-old regional competition. Lexi swam best times in four different events. She took first in the 200-yard freestyle, third in the 100-yard freestyle, fourth in the 50-yard freestyle and 13th in the 500-yard freestyle. All four events were new Madras Swim Team records. "The biggest thing is, Lexi really turned 13 days before the meet," Nelson said. "She went into it as a brand new 13-year-old and placed really well. She was racing against girls that were about to turn 14. Having another year of life, training and racing can change everyone. Just in the last year, Lexi has been able to train and get stronger. The change in the course of next year will be phenomenal." Elli qualified for two events, placing 12th in the 100-yard freestyle and 15th in the 50-yard freestyle. Elli was also able to swim in a time trial, which was an official swim of her choice to get an official time. She decided to swim 100-yard backstroke and did very well. "She crushed it," Nelson said. "She went a second and a half faster than she has ever gone before, which is significant in a 100-yard race. It was also a new Madras Swim Team record." "It was a great meet," she said. "You can tell by the expanse of the states that are there, people are flying in from Alaska, Hawaii, Wyoming, to all compete in this meet." Regional qualifiers are allowed to swim at the sectionals swimming competition, which adds more states to compete against, but coach Nelson is planning on having the Lexi in the Western Zone Championships. "The Zone Championships is another meet where they divide the country," Nelson said. "It is the Western United States. California held it last year and this year it will be held in Oregon. It is a fun meet because they represent Oregon and not Madras Swim Team. They get to come together as an Oregon team." Lexi did qualify for sectionals, but only in one event. She would be allowed to swim in four events at the Zone Championships, which played a big role in her decision to swim at that meet. "My philosophy is every opportunity is an opportunity to do our best, but learn along the way, whether we have success or failure," said Nelson. "You can learn from every part of it. Every part of your race, your trip, every part of the entire experience. We want to have takeaways and learn something from it."